Torquay manager Chris Hargreaves says Aaron Downes' actions for his sending-off in the were "utter madness". The defender, 29, allegedly headbutted John Akinde off the ball, with Barnet already down to 10 men after Bondz N'Gala was sent off. "A moment of madness that I'm furious with has probably cost us the game," Hargreaves told BBC Radio Devon. 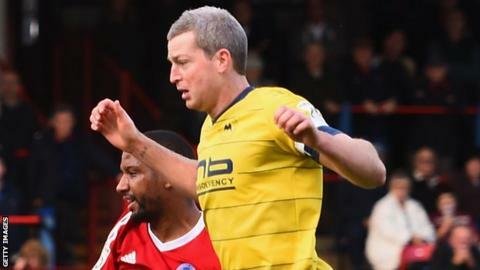 Downes faces a four-game ban after a sending-off at Telford in September. The Australian and has played 97 times for the Plainmoor club, scoring 14 goals. He has also been given four red cards during his career at the club, seeing red twice in his first season. "A bit of good play has gained us a red card," Hargreaves said after ex-Plymouth defender N'Gala was sent off for fouling Ryan Bowman when Torquay's top scorer was through on goal. "I don't like to see people sent off, but by the letter of the law if someone's clean through, then it's a red. "Their gain was our madness, our utter madness, and that's why I'm furious."